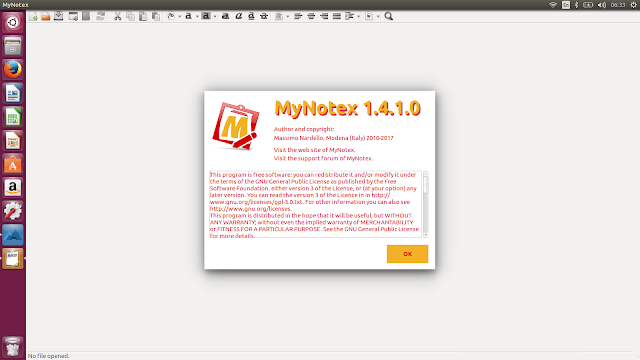 MyNotex is a free software for GNU/Linux to take notes, to file documents and to manage activities. Notes are gathered under different subjects and are made by a title, a date, a tags (keywords) list and a free-length text. This may be formatted: it is possible to change the font name, size and color of a selected text and of its background, and also to set bold, italic, underline and strike-through; the text may have pictures within it. The software can manage paragraph alignment, bullets, numbered and alphabetic lists with automatic indentation. Each note may have any number of attachments (files of every kind), and has also a spreadsheet-like grid to manage a list of activities which is quite similar to the one used in many software of project management. The various activities of one or all the notes of a file may be shown in a diary view and possibly exported in iCal format. A single file of MyNotex contains various notes filed under different subjects. The French language file is broken, so the menu items are not shown. As a workaround, download the correct French language file from https://sites.google.com/site/mynotex/files/fr.lng?attredirects=0&d=1, rename it as "translation-1.4.0" and copy it in the folder ~./config/mynotex overwriting the existing file with the same name (fixed in the 1.4.1 version). If an already existing condition is added to the find procedure, the software reports it more times in the condition list (fixed in the 1.4.1 version). In some rare circumstances, opening a file of MyNotex, the text of the first note is not shown (fixed in the 1.4.1 version). In the export procedure, the names of the headers of the activity list of a note are always in English (fixed in the 1.4.1 version). Moving up and down a paragraph in a list, the bullet is not updated (fixed in the 1.4.1 version). If all the activities of a note are deleted, the label at the bottom of them is not cleared (fixed in the 1.4.1 version). The software hangs on printing if no printer is installed (fixed in the 1.4.1 version). The GetDeb repository contains the latest packages of MyNotex, available for Ubuntu 16.04, Ubuntu 17.04 and derivatives.